If you’ve been tormented for years by your teeth or bad dentures, it’s time to consider a permanent solution. The All-on-4 dental implant procedure uses a revolutionary new technique that allows for a quick placement of permanent dental implants so patients can leave the same day with fixed, non-removable replacement teeth. With this new technology, dental implants are easier to place, less invasive and have a more successful outcome than ever before. This simple procedure gives patients 90 percent of their chewing ability back, with less pain and at a much lower cost than traditional implants. 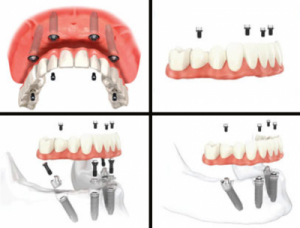 The All-on-4 dental implant procedure uses four implants, with the back implants angulated to take maximum advantage of existing bone as opposed to the conventional method of placing the implant straight into the bone (which can require sinus lift, bone grafting and 6 to 9 months minimum to heal). Your implants will be immediately fitted with replacement teeth, so the entire process, including any necessary extractions, can be completed in one day with minimal recovery time. The result is a fully functional set of teeth that looks natural,enhances self-confidence and allows you to once again experience the foods and activities you enjoy most. 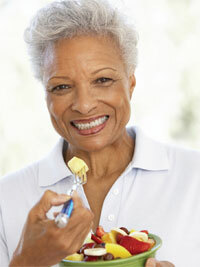 Almost everyone that has lost a tooth, several teeth or even all of their teeth is a candidate for dental implants. On your initial visit with Dental Solutions of Little Rock, we will perform a clinical examination of your mouth, jawbones and general health to determine whether the implant placement procedure is right for you. Once we determine you’re a candidate, we’ll schedule you with our partnering Oral Surgeon’s office for your free computerized 3-D CAT SCAN ($700 value). Invest in a Better Quality of Life! Thanks to this amazing new technology, you now have the opportunity to change your life for the better. When you choose Dental Solutions of Little Rock for your All-on-4 dental implant procedure, you’ll never have to experience the crippling effects of loose dentures, being unable to eat the foods you enjoy, messy adhesives, removing teeth at night, the embarrassment of dentures slipping during speech or smiling or the bad breath associated with wearing dentures. Don’t let your teeth (or lack thereof) hold you back another minute! Ask about our easy financing options! Take the first step toward improving your quality of life! 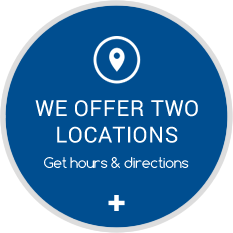 Contact Dental Solutions of Little Rock and set up your no-obligation consultation today. Learn more about All-On-4 by reading our FAQ’s.